An important part of the pulp production process involves the use of superheater panels manufactured from composite steel tubes which are used with chloride within the pulp bleaching process. Accumulations of the chemical, in conjunction with the high temperatures involved, were detrimental effect on the existing carbon steel tubes. 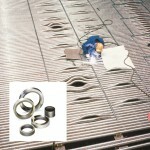 Based upon evaluation findings and previous experience with Sandvik products, the decision was taken to select Sandvik Sanicro 28 composite tubes for the superheaters, which were installed and are said to have since proved to be an excellent choice by reducing the amount of downtime required and enabling continuous production.